It's that time again. Monday. Last week I was asked what we do for breakfast and lunch and where I get me recipes from. I really should plan breakfast and lunch, but I don't. So often it's on the fly. Breakfast will consist of most often toast, from sprouted grain organic bread, my boy loves eggs and will often have an egg on toast. I'll make pancakes, french toast or another favorite of the kids is oatmeal. We rarely do cereal as I can't find a nice organic one we all like that doesn't cost a crazy amount of money. Lunches, if there are leftovers we will do that. If we didn't have toast for breakfast we may have for lunch. My kids love guacamole so I often will make that for lunch or popcorn and yogurt. It's generally pretty low key. My boy doesn't like cheese, but for a treat I'll make the girly Annie's organic mac and cheese and the boy will have an egg on toast. I'm a Pinterest Junkie. The majority of my recipe are from Pinterest or my own head. I love to search recipes for a base idea and then change it up to suit my family. I add as many veggies as I can to whatever I'm cooking. So my kids are used to eating things like kale and swiss chard mixed in with everything. I don't believe in hiding the veggies in a meal, I want my kids to realize they are eating it and do like it. I try to remember to plan my week with my more labor intensive meals at the start and easier ones later in the week, when I'm not as energetic to make something big. Also, checking the calendar to see what we have going on for the week is always a good idea so I don't plan a big meal when I have an appointment and realistically can't get it made. I have a handful of meals that I know are my family favorites and my kids don't argue about eating. I almost always make sure to have a family favorite the day following a new meal. I try to make soup once or twice a week and I also try to have a vegetarian meal once a week. I don't always accomplish all this, but the key work is try. And if I don't stick to my menu plan I don't stress. 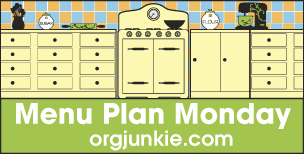 As always, be sure to check out The Organizing Junkie for many more weekly menu plan ideas.